This week, for the first time since the days of those hockey games, I found myself craving a warm mug of hot cocoa. A wave of brutal arctic air has settled over New England, and basically sapped me of motivation to do anything but hide under a giant blanket on the couch. I did go out to run errands one day and when I came back happened to be pulling in at the same time as my neighbor. We chatted for maybe 10 minutes, and by the time I got back inside my fingers hurt so much! I immediately decided to make myself hot cocoa to warm up. 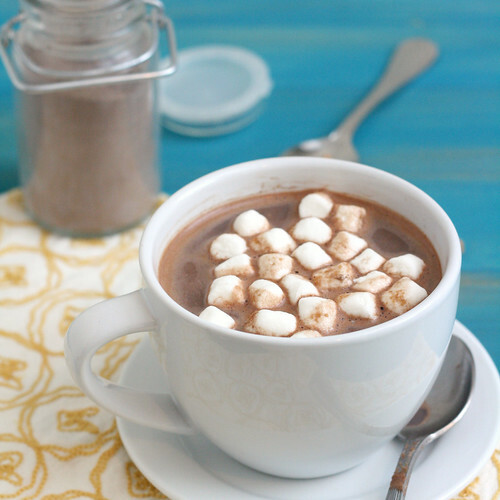 To make hot cocoa with the mix: Stir 1/3 cup of the mix into 1 cup of hot milk. Garnish with marshmallows, whipped cream, or your favorite topping before serving. The mix will keep for 3 months if stored in an airtight container. 25 Responses to "Homemade Peanut Butter Hot Cocoa Mix"
This is crazy but I just saw this recipe on their site and posted on their Facebook wall with a question about it! They mentioned cornstarch in the description b/c they said it thickens it, then in the ingredients list they don’t include it. So I wrote on their Wall asking. I’ve never done anything like that, ever! And then…I open your post. What are the odds??! Now I just HAVE to make this. Amazing looking stuff! Now you have me thinking about all of the chip possibilities…cinnamon chips (Mexican hot chocolate)…mint chips….Yum. Thanks! I’ve never even heard of peanut butter hot cocoa but it sounds AMAZING! Can’t go wrong with choco + pb! I tend not to like to drink my calories (I’d much rather eat them!) so hot chocolate is definitely a once-in-a-while treat for me also. But with peanut butter mixed in…it might become a daily occurrence. How fun! I modified the hot cocoa recipe I have on my blog to be peanut butter by substituting the white chocolate chips for peanut but chips and loved it. Although next time I want to try the powdered PB. Loooove this! Using the peanut butter chips is genius! Love the addition of peanut butter chips. . .great idea! I don’t usually indulge in hot chocolate, but oh my gosh, this sounds irresistible with peanut butter! It really would be a great winter gift, and probably more appreciated when there aren’t so many holiday goodies around the house. 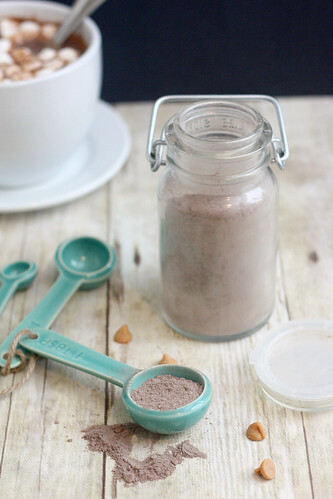 I love the idea of a make ahead, DIY hot cocoa mix. Plus, this sounds and looks amazing! I am definitely a hot beverage person. 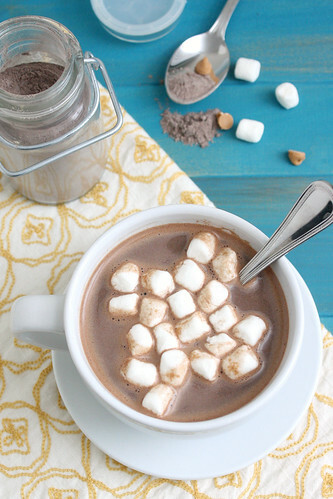 I have been on a hot cocoa kick this year, but haven’t tried it with peanut butter – it sounds great! Yum this looks like the perfect winter warming comfort drink! I would be all over this stuff!! We love hot chocolate over here – although my husband is not really a peanut butter fan. Wonder if I could change his mind with this?? I am totally a hot beverage person and I’m on board with this. It looks so good! That mug of hot cocoa looks delightful. I’m not a huge beverage person either. The only drink I really drink is water, sometimes fruit juices and on rare occasions, hot cocoa. Every time I have hot cocoa I’m reminded of why I love it so much. I love this so much! I don’t think I’ve ever had PB hot chocolate but I need it in my life. Yum! Never thought to put peanut butter and hot chocolate together but sounds like a great combo! I love the regular version of this hot chocolate mix, and I can’t believe I never thought to put peanut butter chips in. Oh, the possibilities! So smart.